TOTAL 90 LASER III: A DAY IN THE LIFE…..
Red carpet and bright light, cocktails, canap'©s and champagne, B list celebrity guests. Dream on. 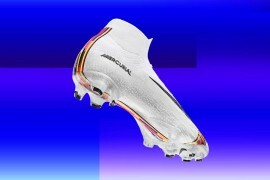 Football boot launches are the real deal. After a marathon game of paper-scissors-stone, Kyle, sweating profusely and with bags the size of footballs under his eyes, stood victorious at Footy Boots HQ. For having beaten the rest of the team he was now in possession of the ‘Golden Ticket’. 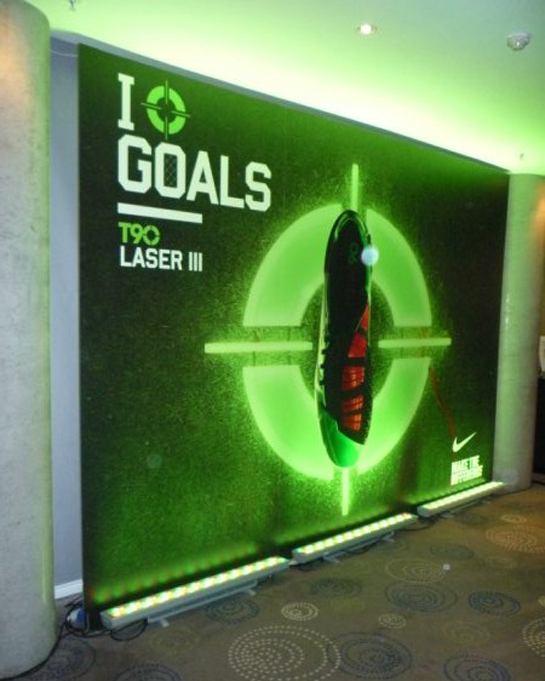 A trip to Manchester for the Nike Total 90 Laser III official launch. Starting off the day in a manner fit for an athlete, Nike stuffed me full of the finest pastries and coffee money can buy; seated in a huge meeting room in a 5 star Manchester hotel I overlooked the dreary Manchester skyline and had a chat with a gathering of media from the four corners of the globe. After having a somewhat surreal chat with Mr Takuya ‘Tak’ Nagata from Japanese outfit Sankei Sports,' a rather cheery (suspiciously cheery for a Monday morning) Nike representative then appeared to ask us if we’d like to make our way through to the presentation suite – the Laser III was ready and waiting for us. Walking down a corridor with huge pictures of Nike’s new boot plastered down the wall, illuminated from all angles with lights following the newest Laser’s infamous green and red colour scheme, we were shown our seats and we were given an introduction to the day by Head of Communications for Nike Europe, Charlie Brooke. Charlie then made way for Chris Tyler who talked us through many of the new features and key points for the Laser III, before giving the floor to Simon Owen, who gave us an insight into all the thinking and tactics that Nike have put into their new Nike Accuracy+ training. Being a geek for all things boot related I introduced myself to Chris (who happens to be a fan of the site) who was happy to give me a few minutes of plenty of personal insight into the boot and his career in the industry so far. With the morning turning to afternoon, Nike laid on some lunch for the gathered press. I had a little chat with some of the Nike team (whilst trying to hide the fact that the chicken skewers were much too spicey for my tongue…), before we were told that Manchester United’s top scorer was on his way. Heading back into the Laser Room, the stage was now adorned with a couple of leather chairs and it was clear the interview was only moments away. Arriving onstage to applause, Rooney was as casual as you like – T-Shirt, sweatpants and trainers (with Nike(Red) laces) were the order of the day as he answered some questions about the boot, the season so far and the games ahead. Despite his marauding personality on the pitch, Rooney was almost a little retiring when answering the questions – a true footballer’s player – you can tell he’s the sort of guy that’d much rather get on with things and just play football! After closing off the interview session, Wayne was kind enough to pose for some photos with the football boot before being whisked away. When this intrepid reporter dared to ask if he was heading to the airport for a medical at the Camp Neu, I was assured he was heading back to Old Trafford…you heard it here first folks!! Nike then piled all of us who fancied a chance to try out the football boots for ourselves onto a coach to take us to an all-weather testing facility. Greeting us in the changing rooms was a personalised kitbag, with a pair of Laser III’s, a T90 training shirt and shorts (the things I do for you guys…), some socks, and shower gel and a towel for after. 3 shots from the 3 angles, with a maximum of 30 points available. Ashamedly, I only racked up 6 points, after getting 2 points for my volley and 4 points for getting side netting with my left foot, my newfound confidence was telling me to go for the top corner worth 10 points on my trusty right to win the competition. Naturally, it flew outside the post and wide of the mark. I blame the boots!! Winding down the day with a quick game, myself and Ben Cove from Football Punk formed the best all English frontline since Shearer and Sheringham to redeem some of the dignity I lost on the Torres challenge! Some handshakes and thanks to the team at Nike later and the day was over, and it was back to start writing up all the news that wasn’t tweeted from the day. It’s not all top player interviews and free swag, you know. You lucky B**T**D! Shame you let Footy Boots down scoring only 6 points on the Accuracy+ test. @Footy Boots – next time send Kyle to do the writing (and eating) and me for the practical stuff! Splinter – if there was ever a day to flaunt your silky Brazilian skills, Monday was it! I promise to try harder next time! Does anyone have these boots? Im think about them but not until they come out in a better colour. Nike seem to be putting alot of monry into the marketing of this product. You should have asked Rooney why he dyes his beard ginger. Great report Kyle. Im really warming to these boots in the last few days and even the green colourway. The problem I have with these so called ‘power’ boots is are their claims actually true? Both Predator and Lasers claims in the past have been better swerve, power and control. Now it seems the main theme of these new lasers is to provide better accuracy and what I would like to know is do they actually do this? Do the rubber fins actually help with accuracy? I would like to believe they do but in reality I believe if you have the right technique and ability you can to ‘put the ball where you want it’ with any boot. Thoughts? itĂâ€šĂ‚Â´s all about money. Good products donĂâ€šĂ‚Â´t need much commercial. Ask people who buy predators. I agree 100% with you Perry. I doubt any of their claims are actually liable. Plus I while back when I saw predators being tested with a robotic leg and I don’t think anyone is strong enough to use the features to their advantage. In my opinion it’s just technique and what part of your foot you use to kick the ball. I remember someone saying this on a review but the swerve zone at times just shows the kick where they should kick the ball rather than improving their shot. Hi Perry! If you’ve ever read any of my tests, you’ll know I’m a huge sceptic of features like the ones you mentioned! As Quaresma said, I think they’re more a guide to show you the best place to kick the ball with certain places on your foot. Paragon – interesting point. Adidas have been a little more quiet than Nike recently, but I did think their ‘Every Team Needs…’ campaign was awesome! The Predator_X one with Gerrard as the Powerhouse and Beckham as the Marksman was easily one of my favouites of last year! That was chance to be the first Brazilian to do well in English football! kinda funny how nike is trying so hard to promote the laser III. i can’t recall CTR360’s campaign anything near this. no huge posters of red CTR360s, no slogan whatsoever, their “master control” iPhone application doesn’t even made the headlines on iTunes -yet, CTR360 probably are the best selling boots on any store near me. at perry, in theory and according to the laws of physics and science, depending on the way you strike the ball, the ball should hit the target, it all depends on many factors, power, trajectory of ball, momemtum of ball etc. in other words, its you and how the state of the ball when you strike it. @ Perry Groves , yes and no mate. Logically, the fins should help your accuracy, if not inherently, then definately giving you a target where you will make your foot meet the ball more consistently. However, at the end of the day, it is 99.999999% technique. Van Basten, Bobby Charlton, Andreas Brehme, Platini and the like never had such gimmicks and their accuracy has never been matched. Just get the most comfortable boots you feel and practice, thats all it is really.